Prairie Village Healthcare Center is a skilled nursing and rehabilitation center located in the beautiful community of Jacksonville, IL. We are Central Illinois’ premiere center offering a team approach to comprehensive treatment which enables our staff to give our residents the best quality care available. Helping our residents regain health, independence and an improved quality of life is at the core of everything we do. We provide our residents with personalized, goal-oriented care. Our smaller, intimate size allows us to truly know each and every one of our residents on an individual basis and provide the level of care expected of a caring and quality facility. 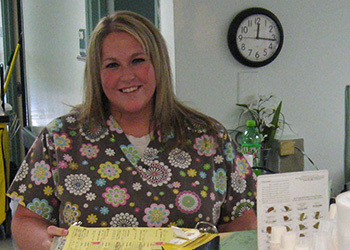 Some of our dedicated staff members, as well as residents, have been with us for many years. Each contributes to our thriving and vibrant Prairie Village community. Often the transition to a skilled nursing facility is challenging. At Prairie Village Healthcare Center, we strive to ease the process by providing an environment where residents and guests feel informed and comfortable. We want each of our residents to live in a comfortable, home-like environment while receiving expert therapies and clinical care from our compassionate staff. In addition to our nurses and staff who are always available to answer questions and lend a hand, each resident is paired with a coordinator, to help ease transition and provide a familiar smiling face. Each resident is then provided with a customized program of care to meet specific healthcare needs for a successful recovery. We are committed to providing residents and family with peace of mind through our responsive, courteous and gentle care. We welcome you to stop by for a visit to our community today. All 126 beds are Medicare and Medicaid certified.